Tender yet exciting, this is a traditional story of growing affection between the cutest little Duckie and Monkey, containing emotional elements of real life: integrity and trust, close friendship, conquering fear, coping with separation, and the importance of developing the ability to be optimistic and to make the best of all situations. Smartly written by Victoria Valentine, and attractively illustrated by Amanda R. Tucker, this endearing story is guaranteed to provide much thought-provoking entertainment for both children (ages 2-10) and their parents. Suitable for home readers as well as for schools and libraries, The Cutest Little Duckie can either be read in bedtime increments or enjoyed as a full-length special treat, and will undoubtedly be read again and again by many. A healthy alternative to television, this book will hopefully help to bring about a renaissance in communication between parents and young children regarding various issues of concern to the young but which sometimes can be difficult to approach in the everyday 'busy-ness' of modern times. The book is perfect bound with laminated cover, 8.5 x 8.5 square, 80 pages long with 70 full-color illustrations (suggested retail price: $18.95). Tender yet exciting, this is a traditional story of growing affection between the cutest little Duckie and Monkey, containing emotional elements of real life: integrity and trust, close friendship, conquering fear, coping with separation, and the importance of developing the ability to be optimistic and to make the best of all situations. It also shows that although one may be small and feel vulnerable, one can stand strong as an individual, and find hope in the bright future created by believing in oneself. Children as well as adults will identify with and fall in love with these adorable "human-like" heroes. There is one drawback: once the word spreads among friends and schoolmates your child will possibly become relentless in his/her attempts to get their parents to purchase this book. The colorful book cover and the many fun illustrations will immediately catch the eye of children who simply must take this page-turning book home. And once they have obtained the book you may have to pry it away from them when it is time for meals and sleep. 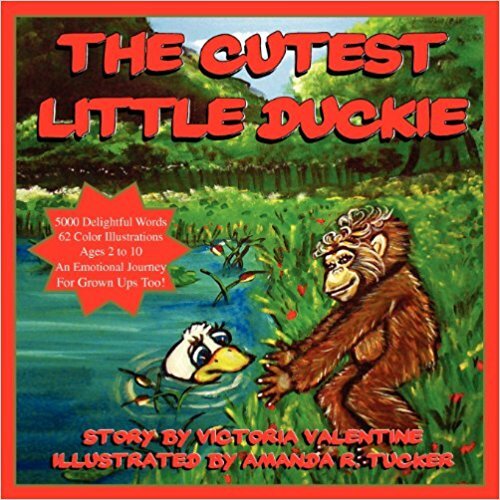 For more information about The Cutest Little Duckie or other Skyline Publications, or to schedule an interview, please contact Victoria Valentine at WaterForestPress@aol.com or see www.skylinemagazines.com. - Literary criticism (2007) by Adam Donaldson Powell (based upon "The Cutest Little Duckie", published by Water Forest Press, New York, USA, www.waterforestpress.com, ISBN 10: 0-9723493-4-0, ISBN 13: 978-0-9723493-4-5, Library of Congress number 2007937854). VICTORIA VALENTINE ( USA ) is the founder, publisher and editor of Skyline Publications, which she created in September, 2001. Skyline publishes multiple titles including Skyline Literary Magazine, SpinningS.intense tales of life, A Hudson View Poetry Digest, At Poetic Times Magazine. Victoria is the co-author of At The Stroke Of Midnight, 24 Tales of Terror. She also wrote lyrics for 5 songs included on the Eyes Of Ash CD performed by The Unintended of NY. Victoria resides in New York, USA . She has been writing since childhood and through the years has gathered various literary and art credits. She has been published online and in print magazines in the USA , UK , France , India , and in South Africa.